This guy was challenging and fun. Here in Florida there are lots of pelicans and this guy posed perfectly for me. I worked on this piece for quite a while. When I removed the masking, the values in the water and the bird were too similar, so I glazed the water with a very wet, thin wash of French Ultramarine Blue to cool it down. It worked. The happy bird suddenly popped off the page. I was very happy with the result on this one. For those who want to create these types of colors I used: New Gamboge, Quinacridone Magenta and French Ultramarine for the first pour/layer. Subsequent layers were created with combinations of these colors plus Quinacridone Gold, Permanent Alizarine Crimson, Pthalo Blue, and Burnt Sienna. The secret is to only pour with two or three colors at a time and to prevent the colors from blending too much (creating mud!). This means lots of layers, lots of drying time and lots of time to think about the next application of paint. 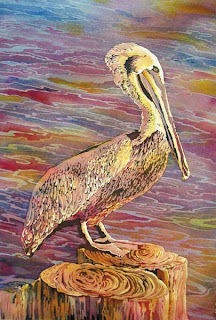 My favorite thing about this technique is that I can create details and crisp lines with the masking fluid, yet keep the wet, gorgeous color blends with the layers of poured or very wet washes. I hope you enjoy this one! And I love to hear from you. Please feel free to leave your comments!